BLS110 BALL. Detent Ball or Interlock Ball. 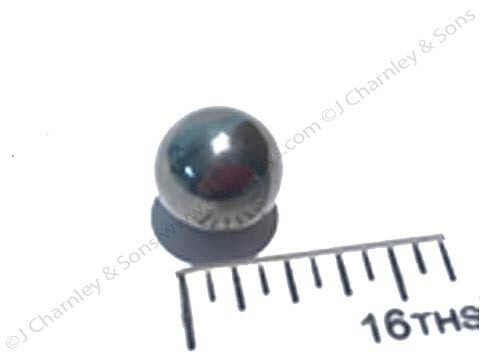 This steel ball is used in many locations on Nuffield, Leyland and Marshall tractors. Two used as detent ball on gear range change lever selector rod and two used on speed change gear lever selector rod. See item 15 in this illustration. Leyland Lightweight tractors with 2 speed power take off. Used as detent ball on PTO change lever selector rod. See number 24 in this illustration. Nuffield and Leyland tractors with 5 speed gearbox. Used as detent ball on main gear lever selector rods. See number 15 in this illustration. Leyland tractors with a 5x2 10 speed gearbox. Used as detent ball on the three main gear lever selector rods and the high/low gear lever selector rod. See number 20 in this illustration. Leyland and Marshall Heavyweight tractors with 2 speed PTO. One used as detent ball on the PTO change lever selector rod. See number 28 in this illustration. On Leyland and Marshall tractors with 3x3 Synchro gearbox. Two used on 1,2,3 and reverse gear change lever selector rods and two used on low, medium and high gear change lever selector rods. See number 4 in this illustration. Two used as safety switch pin actuator.